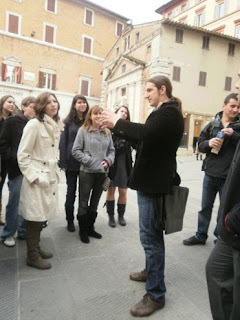 Perugia has about a 3 to 1 ratio of nooks to crannies, Umbra Institute students found out yesterday. Sunday afternoon saw two editions of the “almost internationally-renowned” (as history professor Zachary Nowak describes it) tour of Perugia. Nowak took the students on a sun-drenched traipse around Perugia’s center, recounting anecdotes and stories about monuments and people in Perugia’s past.